Education is the key to success. It will give us the wisdom that we need to become more successful, prosperous and happy in life. Our parents usually tell us to finish school and have a degree in College. Having a degree is very important not just for parents but mostly for us. 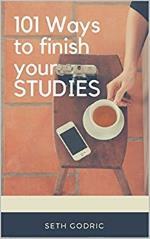 There are various ways to finish your studies. Its not easy to study, you have to put all your efforts to have better grades and best performance in school. 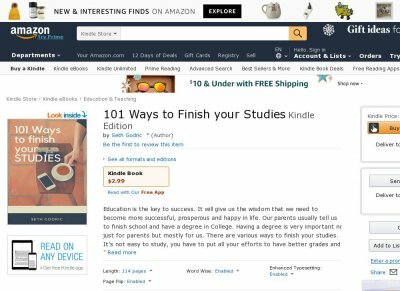 101 Ways to Finish your Studies will guide you in your daily activities in school. Before you start the class, during your class and after your class. You need a laser-sharp focus so that you can be sure to pass all your subjects while having your extracurricular activities. In this book you will learn some of the ideas below and much more in this book Having a Clear Goal Using Mnemonics How to keep motivated Continuous learning Taking care of yourself Knowing your teachers Having a scholarship You will surely enjoy reading the 101 ways or tips for you to finish your chosen degree. This book is a sure guide for every student to achieve success in their graduation day.